First-of-its-kind incident in Gaza: Israel Defense Forces Chief of Staff Gabi Ashkenazi admitted Tuesday that a Kornet missile had been fired at an Israeli tank earlier this month. Ashkenazi told the Knesset's Foreign Affairs and Defense Committee that the missile penetrated the tank's outer shell but failed to explode inside it. There were no injuries in the incident. "On December 6, a Kornet anti-tank missile fired for the first time in Gaza hit an IDF tank and penetrated its outer shell. Luckily, the missile did not explode inside the tank. We are talking about a massive missile, one of the most dangerous in the battlefield, which has already been used against the IDF in the Lebanon War." Earlier, Ashkenazi told the committee that "the reality in Gaza could be fragile and explosive." 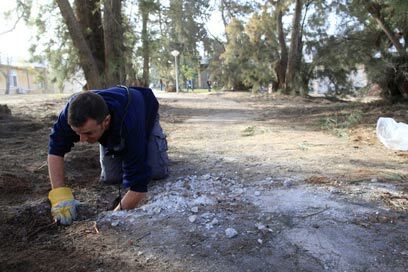 He spoke several hours after a Qassam rocket exploded near a kindergarten in a western Negev kibbutz, lightly injuring a 14-year-old girl. Several people suffered from shock. 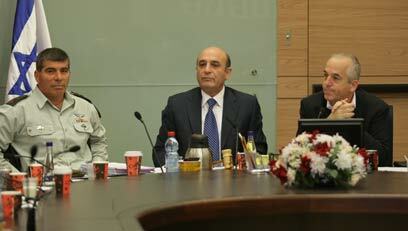 The IDF chief briefed the committee on the security activity following the rocket fire. "We have increased our operations in the south on the backdrop of terrorists' attempts to boost their activity. Most of the IDF's activity in Gaza is directed beyond the fence. We are working some tens and hundreds of meters from the fence, in order to prevent them from reaching communities." In the past few months, Ashkenazi said, the IDF had initiated 112 operations against terrorists, killing 60. Five of them – affiliated with the Islamic Jihad – were killed on Saturday. "Yesterday we attacked Hamas targets and posts along the region," he said of the latest strike, which left several Hamas members hurt. "The main elements controlling Hamas in Gaza are the Hamas chief of staff Ahmed Jaabri, and not Prime Minister Ismail Haniyeh," the IDF chief said. He stressed that the army "views Hamas as the responsible group in the Strip, so even if they're not the ones hiring, the IDF attacks are carried out against them." The army chief added that the first regiment of the Iron Dome anti-missile system was expected to be operational in the beginning of 2011. "We'll decide how and where to station it." Ashkenazi said that "it's wrong to develop excessive expectations. The response provided by the Iron Dome system is not perfect. We are working to improve the ability to identify mortar fire in order to increase the alert period. Overall, the situation in the south is fragile and tense, and an escalation is possible. Hamas continues to grow stronger." He said the situation in the West Bank was relatively calm. "Nonetheless, there are terrorist activities below the surface, which we regularly thwart. Possible progress in the negotiations with the Palestinians is not expected to lead to deterioration in the security situation in Judea and Samaria. Addressing the situation in Lebanon, Ashkenazi said the tensions were high ahead of the publication of indictments in the murder of former Lebanese Prime Minister Rafik Hariri. Moving on to Iran, he said that "the Iranian nuclear project is progressing, despite difficulties from all kinds of directions. They were surprised by the international sanctions, including those imposed by the Chinese and Russians." The IDF chief said that 13,350 infiltrators had entered Israel through the Egypt border over the past year, but reported of a certain drop in the number of infiltrators in December, apparently due to internal problems in Sudan. "The fence is a better obstacle," he said, "but it won't prevent infiltration. We are building three segments. Now we have added drones, Hummers and night vision systems. The solution also required legislation changes, which will allow Israel to return the infiltrators to their homelands. Asked about the option of shooting at the infiltrators, he responded: "I know my people, they won't open fire on refugees." Addressing the rise in the number of volunteers to combat units from 64.3% to 74.2%, the IDF chief said: "We are working hard on motivations." He lashed out at young women declaring that they are religious in order not to be drafted, and warned of an increase in the number of draft dodgers. "If you check first grades these days, 50% of them will not serve in the army in 12 years. This is a social problem, not a security problem. I need these soldiers. Haredim must be recruited, and Arabs must be recruited to national service." As for the WikiLeaks publications, Ashkenazi said that "it's a very bad thing, which affects our relations with foreign countries." See all talkbacks "Ashkenazi: IDF tank hit by Kornet missile "